Picnic Papa Teddy Bear by Steiff. This beautiful hand made piece, in reddish blond mohair, is fully jointed and wears the white ear tag, signifying this item as a Steiff limited edition, together with the famous gold plated Button in Ear. Limited edition of only 1000 pieces worldwide. Product details: safety eyes, synthetic filling material, non growler, size 32cm. Comes boxed, together with a numbered certificate of authenticity. Ashby Bears proudly present Picnic Papa from the the new Steiff picnic family. When Picnic Papa is out and about he cannot be without his bottle of red wine. With that a baguette, some cheese – he already feels as if he were surrounded by the lavender scented summer breeze from his favourite landscape in Provence. He can really not get enough of it! 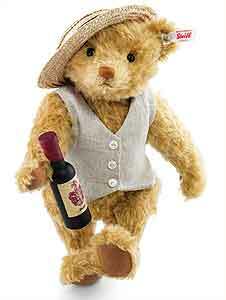 Picnic Papa is made from the finest auburn mohair, wearing a straw hat with a burgundy satin ribbon, a beige linen vest and has a wooden wine bottle (because it lasts longer). He invites his family to a picnic and everybody else who want to join in. Don’t miss out on this piece of French lifestyle!